I once had a construction lawyer say to me, "If there were one thing I would say to both contractors and homeowners to prevent problems during construction projects, it would be, 'All change orders should be in writing!" One day, I will go through my active cases and figure out how many of the disputes could have been prevented if the parties were to follow that rule. Homeowners frequently believe that items are included or will not cost extra. Contractors submit bills after the fact for "extras" that were unanticipated. Then the misunderstandings occur. Change orders should include a full description of the new work to be done, the types of materials to be used, and how the change will affect the expected completion date. They should spell out the additional price for labor and materials. Finally, they should be signed off on by all parties. If subcontractors are to be used to affect the change orders, I would note that down as well. It does not imply distrust to write down the agreement between the parties. Instead, it enourages clear-cut communication and prevents problems. So, make sure that you spell out all change orders to keep the project running smoothly. Maybe home improvement workers are immortal. Look at the attached photo. These guys are on the third floor. Maybe they are not affected by gravity. 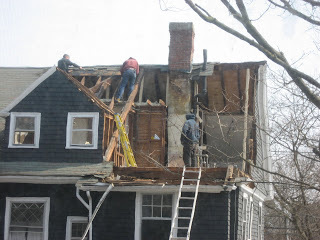 If you cannot spot OSHA violations in this picture, you need to get some training. Protection against falls is something OSHA emphasizes all the time. It is one of their biggest concerns. They look for fall hazards on every construction inspection, and they almost always find them. Between October 1, 2006 and January 31, 2007 8 workers died from falls in New England. Violations of fall–protection rules are among those most frequently cited by OSHA for residential construction. For residential construction there is a 6-foot fall rule. Every employee who is engaged in activities that are 6 feet or more above a lower level must be protected against falls by guardrails or a personal fall arrest system (harness and lanyard attached to an anchor capable of holding 5000 lbs.) or some other means. If it is not feasible to use conventional fall protection, and you can prove it, you can use your own fall protection plan instead. “Be careful!” is not a fall protection plan. You need to really think it through. You need to train workers and make sure they follow the rules. There are detailed regulations about what a plan must include. You can find the basic rules for fall protection at 29 C.F.R. 1926.501. The specific rules for residential construction are under 1926.501(b)(13). The rules for developing a fall protection plan are at 1926.501(k). Get to know these rules and follow them. It will save you grief with OSHA. More importantly, it might save the life of an employee or a good buddy. In Massachusetts, the state runs a Home Improvement Contractor Arbitration Program that gives homeowners and contractors an alternative to filing suit when a dispute arises. This program has many advantages. For one thing, the cost of filing for arbitration is generally less expensive than filing suit. Once the application is filed, the state oversees the process, and it is usually fairly efficient. Unlike litigation, there is usually little discovery (the exchange of information) which allows the parties to control costs. The program allows for a half-day hearing, and the arbitrator can opt to make a site visit. The arbitrator is also authorized to award double or triple damages and costs under M.G.L. c. 93A. The arbitrator cannot award attorney's fees. The arbitrator's award is appealable (unlike most arbitrations), and the parties are entitled to a new trial if the decision is appealed. All findings of fact issuing from arbitration shall be taken as prima facie evidence in any subsequent appeal. This means that the court will consider the arbitrator's findings when making a decision. The program can only be utilized by either party if the contractor is registered and was hired to hired to perform home improvements on a 1-4 unit, owner-occupied residence. The contractor must have pulled the permit(s) as well. The Contractor and Homeowner hereby mutually agree in advance that in the event the Contractor has a dispute concerning the contract, the Contractor may submit such dispute to a private arbitration service, which has been approved by the Secretary of the Office of Consumer Affairs and Business Regulations. The consumer shall be required to submit to such arbitration as provided in M.G.L. c. 142A. Most contractors think that this clause would require the homeowner to go through arbitration if they have a dispute. I recently had a case however, where the homeowner filed suit, and I filed a motion to compel arbitration. The judge did not agree with my argument, and said that the clause only applies where the contractor initiates arbitration, and it does not prevent the homeowner from filing suit. So contractors need to consider re-writing their contracts if they want to require homeowners to proceed to arbitration in the event of a dispute.